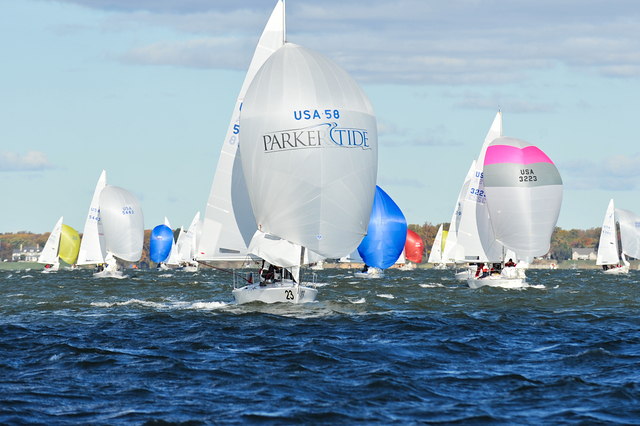 It was another fantastic fall weekend of racing in Annapolis for the J/24 & J/22 East Coast Championship. Teams traveled from across the northeast & mid-Atlantic to join in on the fun this weekend and for the top competition in both classes. 26 J/24 teams raced Friday – Sunday, joined by 13 J/22 teams Saturday & Sunday. We?? ?ll get to the action on the water in a moment ??? the highlight on land was the Saturday evening regatta & costume party! Over 170 J sailors enjoyed dinner under the tent and shortly afterward, the DJ started pumping the tunes and the costumes came out. The crowd even demanded the annual flip-up challenge between the 24s and 22s before dessert! We were too busy dancing under the tent to even hold the costume contest, but we?? ?ve decided that the ?? ?Party Patrol??? placed 3rd, George Washington placed 2nd, and the entire cast from Gilligan?? ?s Island, aka the Blo?? ?viate team, was the 1st place winner! Prior to the party North Sails Zeke Horowitz and Will Welles led the Saturday dock talk, which focused on big air techniques both upwind & down. The breeze was in the high teens, so the focus was on depowering upwind & weight placement down wind. Then, champion oyster shucker George Hastings shucked 400 local Delaware Bay oysters during Oyster Happy Hour before the Low Country Boil, prepared by Bread & Butter Kitchen. Friday evening, Quantum Sails??? Travis Odenbach led a great dock talk and was joined by Mike Marshall, Ian Coleman and Quinn Schwenker. Afterward, the crowed enjoyed local Maryland and cream of crab soups, sandwiches and snacks, before heading out to the Boatyard Bar & Grill?? ?s Full Moon Party! of the race course. Unfortunately for Friday there was only one race, but with the rest of the weekend looking like breeze-on, the race committee stayed patient and sent us in to warm up for Saturday. Saturday brought rain and big winds early in the morning, but at 12:00 the rain lessened and the wind moderated. With the wind direction mostly out of the NW and the breeze at 12 to 18 knots, the J/24?? ?s & J/22’s were eager to get started. The racing was very tricky with a starting line pin-favored and the current pushing out, it was hard to make the line. Starting at the pin-third was a must and getting on to port quickly was a good call. This is sometimes the hardest move in sailing. To be on the line at the start with a tide against you, and to be able to tack and clear the fleet, is tough. Although it was not critical to tack right away, teams were certainly looking to tack early. Something I have learned when this scenario presents itself is to try to be reaching on or just below the line with about 20 seconds to go and then when the gun goes off you can turn up quickly and look to tack. Sounds easy, right? The breeze held on all day and we were able to get three in on this amazing day of racing. On the way out to the race course Sunday for a 1000 warning we had about 10 knots – then the skies cleared, the sun came out and the breeze picked up once again 12 to 18 knots out of the WNW. These were tricky conditions as the breeze was coming from the land and the Severn River. There were plenty of shifts to catch and with the tide starting to come in the fleets became mixed up as everyone tried to regain their bearings. The tide was different than the prior two days and the wind was shifting 20 degrees. 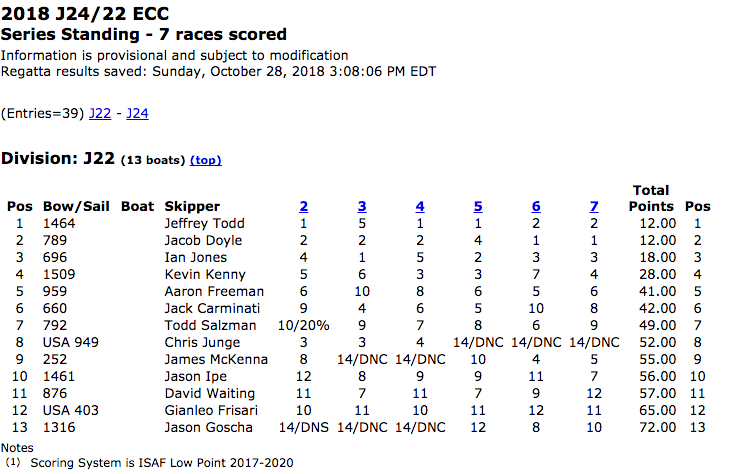 The J/24 fleet had a bit of alphabet soup on the menu for the day – I believe one race had 14 or so Z flags handed out and that meant the scores were shuffling! All in all it was a beautiful, sunny, fall day in Annapolis and I would not have rather been sailing anywhere else!? ?By regattas end, we had sailed 7 races and only one in breeze under 10 knots. Annapolis delivers in the fall once again! Thank you again to all who helped put on this event and to all that travelled & participated! Everyone had a part in making this event the perfect regatta and? ?I hope to see everyone next year! Now, on to the best part?? ?the awards! 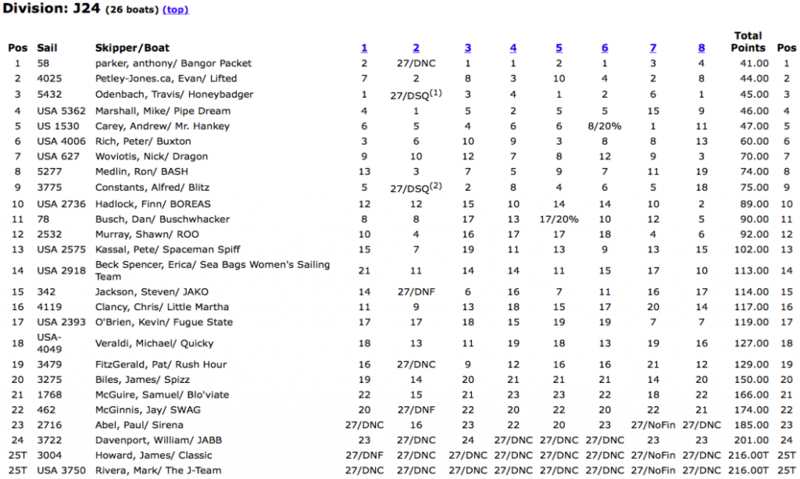 Veteran J/24 class sailor Mark Hillman and his team captured 5th place with 53 points. 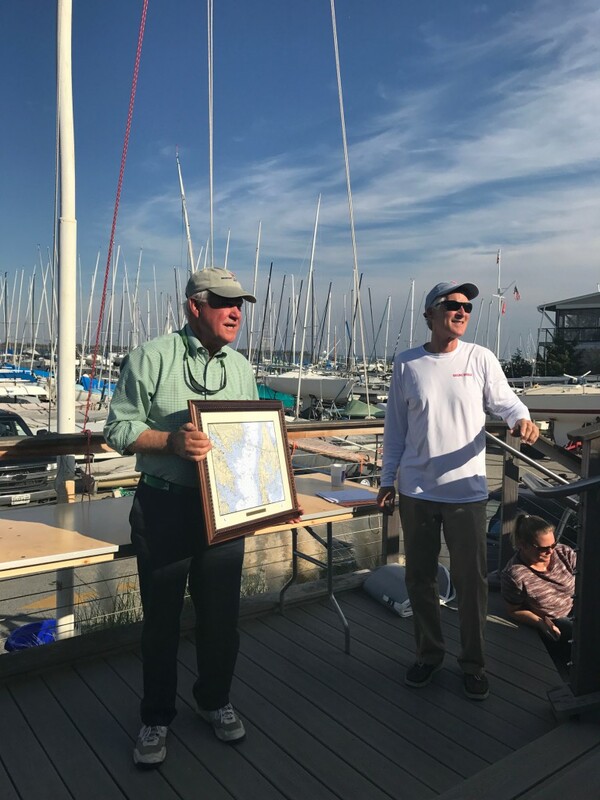 Regatta Co-Chair Jim Bonham and his team on SISU captured the top Corinthian Award with a strong 4th place finish and 52 points. North Sails??? Mike Marshall & the Bogus team finished 3rd. Tony Parker and his team on Bangor Packet finished 2nd with 41 points. Finally, congratulations to our 2018 J/24 East Coast Champions — Travis Odenbach, Ian Colman, Geoff Ewenson, Collin Kirby and Monica Morgan on Honeybadger! 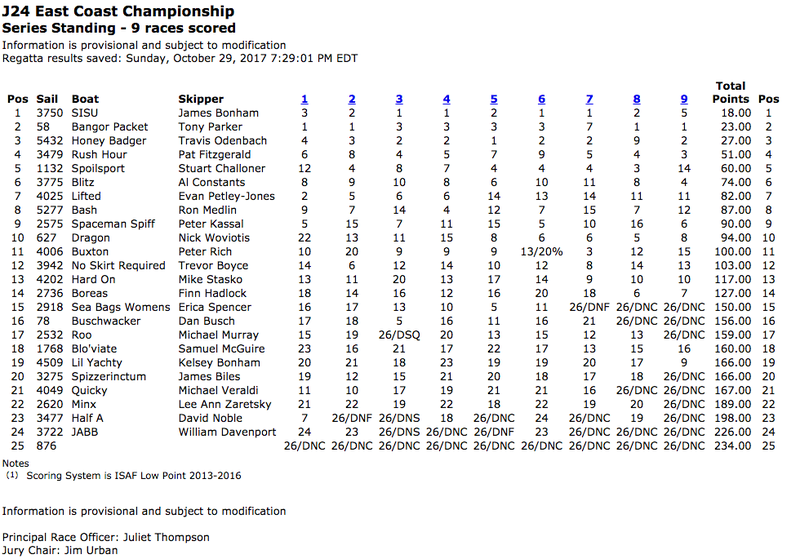 Local J/22 sailor Ian Jones placed third with a total of 18 points. In second place, Jacob Doyle finished with a total of 12 points. And, our 2018 J/22 East Coast Champions are Jeff Todd and his crew on Hot Toddy, Chris Ryan and Chip Carr, finishing with a total of 12 points! Drone Videographer Sam Greenfield, fresh off the 2018 Volvo Ocean Race, joined us in Annapolis for the J/24 & J/22 East Coast Championship! Sam hosted a presentation on Thursday night to discuss the use of drone video in sailing, and other topics including equipment, safety, and more. Sam filmed racing, in addition to SSA?? ?s Carlos Linares, and we?? ?ll post highlight reels from Friday and Sunday available for viewing soon. Thank You Sponsors, Volunteers & RC! A big thank you to our Platinum Sponsor, The Rigging Company for their financial support, in-kind donations and staff support throughout the regatta. Year after year, thank you to Tony Parker and Parker Tide for their Gold Sponsorship. And our Bronze sponsors included Boatyard Bar & Grill, Jeanneau America and FitzGerald Design Build. Thank you to North Sails, Quantum Sails, APS for their generous in-kind contributions once again to the regatta. And last, but obviously not least a big thank-you to the race committee, headed-up by PRO Juliet Thompson and to the many volunteers that helped make this regatta a great one. Congratulations to our 2017 J/24 East Coast Champions, James Bonham and the SISU team! 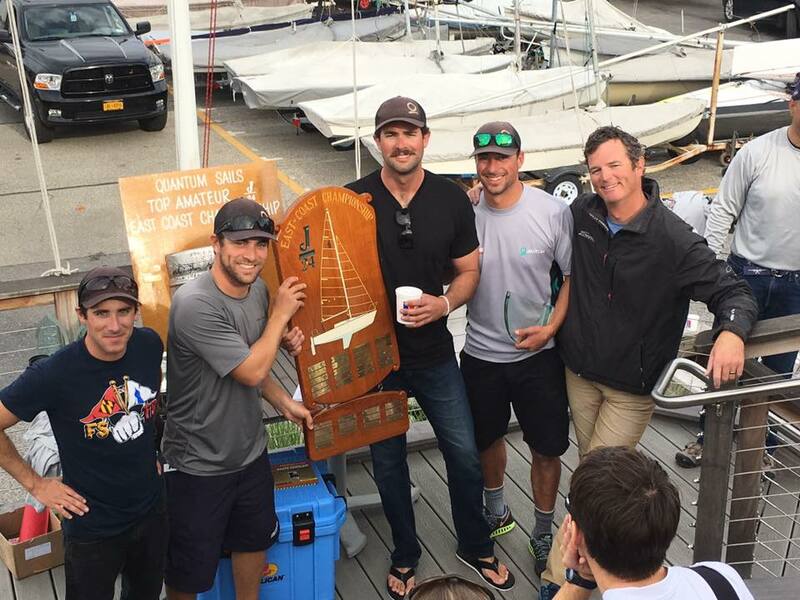 The J24 East Coast Championships are back! After being arguably the most highly attended and most prestigious regatta in Annapolis for the last 39 years, the attendance had fallen off in recent years. But the class put in a sustained effort this year and were rewarded with almost 30 boats on the starting line. 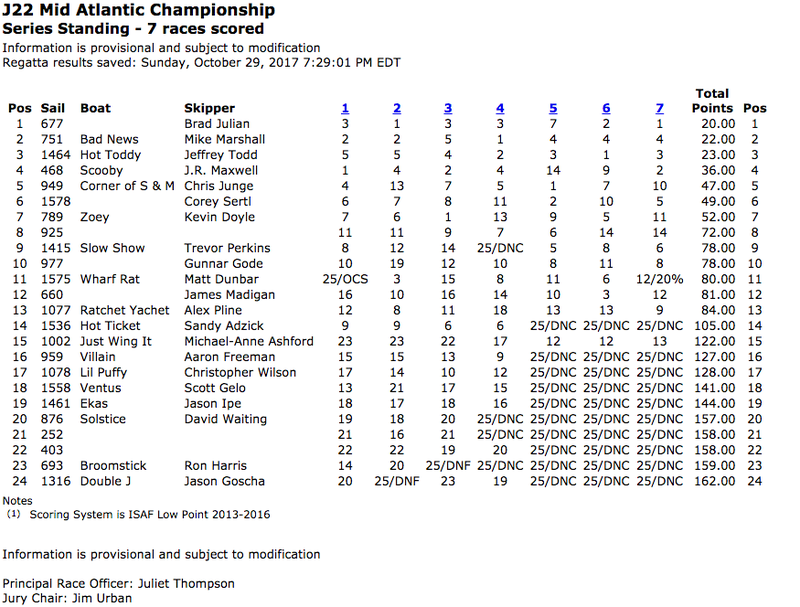 And what a terrific three days of sailboat racing the sailors got. 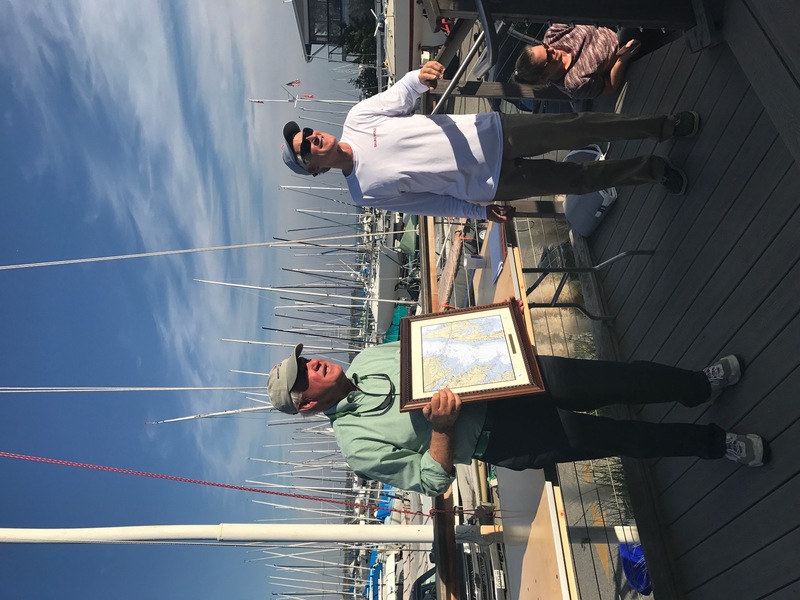 The Chesapeake Bay validated that it is the best sailboat racing venue anywhere in the country in the fall. The conditions challenged all three types of sailing: mid 20?? ?s wind with blades on the first day; ?? ?top of the genoa??? sailing in 15 to 18 knots on Saturday; and light air 4 ??? 7 knots on Sunday. The racing was extremely tight; going into the last race, there were four boats within two points of each other with a fifth only 5 points back. We were able to get a good start the last race, went the right way and kept our main competitors behind us to win the regatta. But the real winners were all the competitors. They were treated to superb sailing in an extremely competitive class over a gorgeous weekend. Coupled with on-land activities that everyone described as outstanding meant that this was, once again, a regatta not to be missed! The weekend of the Oct. 28 ??? 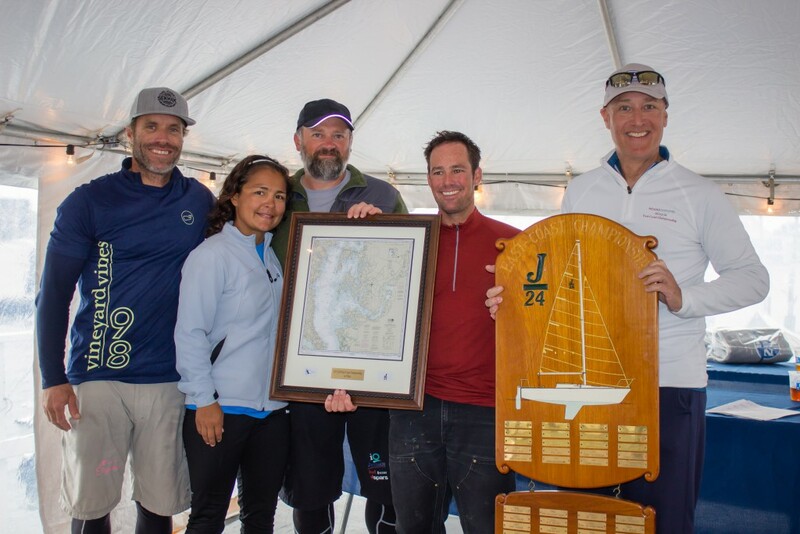 30 marked another great J/24 East Coast Championship for 26 teams from up and down the East Coast (including the Canadian Province of Nova Scotia). This number is up significantly from last year, and the competition ??? well let?? ?s just say there was no shortage of competition! To begin with, the weather came through for the sailors in a big way. Winds Friday ranged between 15 & 32 knots from the NW with air temperatures in the high 50???s. While some boats struggled down-wind, others reveled in the challenging conditions that make this boat thrilling to sail. Winds Saturday ranged from 12 to 18 knots from the S-SW with temperatures in the upper 60???s. This was one of the best sailing days I have ever had in Annapolis! A high-pressure system moved in Sunday with unsettled winds from the SW ranging from 6 to 11 knots, but with air temperatures rising to 70+ degrees! All in all Annapolis provided us with a variety of conditions from great breeze to light and unstable giving everyone a chance to make some points back or extend a lead! 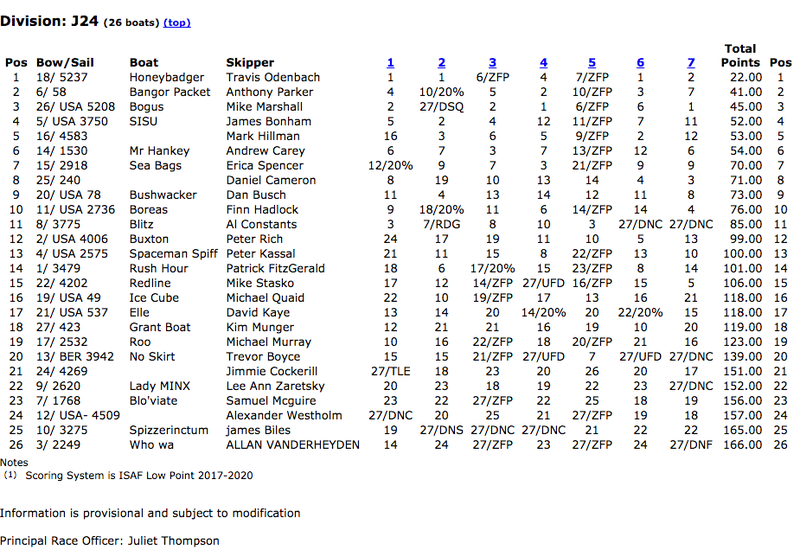 From a competitive standpoint, this 26 boat fleet was the strongest I have seen it in the last 3 years. Mike Marshall was leading the regatta the first two days with very consistent scores. Neither Tony Parker or I raced the 2nd race of the series ??? Tony had broken his main halyard, while I was a bit eager at the start and caught a U flag. I recommend staying away from both of those mistakes! After two races on Friday in big air, boats were beaten up and crews were too, so the RC decided to let us live to fight another day and called racing after two. Read more? ?here!